Modernāma: Salman ko Salaam ! Today is August 9, 2015. Exactly seven decades have passed since Washington committed perhaps the greatest war crime in the history of man by testing a plutonium bomb on the Japanese city of Nagasaki, close on the heels (just three days) after testing a uranium weapon on Hiroshima’s innocents. I say “testing” because such weapons were new to our species and it was yet to be known precisely what their destructive potential was. These two tests in real time helped zero in on the right numbers (for that time. The remarkable thing is that we still do not know exactly how many - obviously non-White - innocents were butchered in this dual savagery. Estimates vary between 130,000 and 250,000). Equally importantly, “Little Boy” and “Fat Man”, as the twin bombs affectionately came to be referred to by the Allied military establishment, also enabled the Untidy State of America to supersede the rising Soviet Union and define the contours of the remainder of the century (by controlling the terms of the Cold War and its hundreds of hot proxies in the “Third” World), if not also the distant outlines of the century we now live in. I remember that many years ago, after India and Pakistan had conducted their nuclear tests, some words of war criminal Henry Kissinger had leaked in the media and he was caught saying that the only two countries on earth which are “nuclear neighbours” are India and Pakistan and they offer the (obviously for Kissinger, salacious) possibility of what an actual nuclear “exchange” between such powers would look like in reality (as opposed to the war-games which provide only conjectural data to military planners and strategists). Warmongers and leaders on both sides of this foolish, metallic, electrically charged border have done everything possible in the last 17 years to bring everyone living in this part of the world rapidly closer to the day of nuclear reckoning. I remember a cartoon from around 1998 in which India and Pakistan go to (yet another) war. Islamabad launches a nuclear-tipped missile at New Delhi. It falls short and lands in Lahore itself, decimating the ‘city with a soul’ instantaneously. New Delhi retaliates by taking aim at Islamabad but instead finds Amritsar’s Golden Temple in the way. In their enthusiastic ghost sonata, in the spirit of Stanley Kubrick’s brilliantly funny Dr. Strangelove, leaders on both sides declare victory! It is with this background, supplemented by the latest refinements of absurdity on both sides of the border, that the film Bajrangi Bhaijaan is to be viewed. How could anyone outside an asylum for the delinquents put up with this hormonal nonsense? Yet, yesterday I broke an important personal code and went to watch Bajrangi Bhaijaan at the strong recommendation of an old and trusted friend. Serendipitously, I found that while I was watching the film in Delhi, my parents too were in a Gurgaon multiplex watching the same film! Certain things are meant to be and sometimes our conscious minds must retire from their supervisory duties. So I left my thought-policeman at home and went to the Vasant Kunj Mall to give Salman a first - and last! - chance. It is worth starting with the film's denouement The last scene of the film is shot in the snows of Kashmir. A huge crowd of common Pakistanis defy military orders and knock down the high-tension wall separating the Partition Twins in order to let their new-found hero Bajrangi Bhaijaan return to India and reunite with his loved ones after having accomplished his Mission Impossible. He has just succeeded in reuniting, in turn, a sweet little girl (who lost her speech after an accident in childhood and who had lost her way in India after being separated from her mother), with her family in Pakistani Kashmir. All of this is achieved without visas and passports - just with lots of help from Pakistani friends who work for a media lovingly curious about India, and who ride colourful buses and are willing to lie in unison to the authorities if necessary - in order to enable safe passage for their ‘trespassing’ Indian visitor on a noble mission. A simpler denunciation of the modern system of nation-states, a cowardly, cruel import in the first place from the God-forsaken (hypocritically “secular”) Western world, is difficult to imagine. Its deep-seated indifference to human well-being and its routine cruelties on all sides are in evidence throughout the movie. Love for one’s country is a wonderful thing, the movie seems to agree with Albert Einstein, but must it stop at the border? And why must love have to stand in queues for passports and visas? Shaahon ke darbar mein kahin ishq jhooka hai, I can hear Geeta Dutt sing behind me. In a memorable scene, poor Bajrangi goes with little Munni to the Pakistan High Commission in Delhi to look for a visa - without a passport in hand! Not only is he summarily dismissed, he is witness to a riot organised by a Hindutva mob trying, in the language they know best, to get back to India a certain ‘Karamjeet Singh’, held by Pakistani authorities. Bajrangi has to defend himself and Munni against them with the help of a bamboo bayonet which has “POLICE” emblazoned on it! The film does not spare the religionists who are always in search of the political capital that God can help them accumulate and disburse. Salman’s character, Pawan Kumar Chaturvedi, is a bumbling dropout from Pratapgarh (UP) who clears Class X exams at age 30, on the 10th attempt, giving his father a fatal heart attack in the process! He becomes a Hanuman-bhakt after failing at the local sport of public choice, wrestling. Masculine bravado is mocked when it turns out that Pawan gets tickled when he is tackled! No one ever performed a better judo on the RSS - one of whose shakhas is seen fleetingly in one scene. Love conquers even ardent vegetarianism when we find Bajrangi Pawan Kumar Chaturvedi arranging a feast of chicken for little Munni when he realizes that she is “Mohammedan” and finds her secretly enjoying a meal in a Muslim household in Jama Masjid. Pawan’s slogans throughout are “Jai Shri Ram!” and “Jai Bajrang Bali ki!” They could not cut closer to the jaw-bone. His faith is so redoubtable that even in Pakistan he looks for Hanuman-Bhakts! God is one. His forms are countless many. This is the message. It is this Great truth that will bring our people together again one day. We have already seen the first real consequence of this landmark film. Geeta is a young “Indian” woman of 22, who is unable to speak. She lost her way to “Pakistan” many years ago. She was found by someone who took her to the famous Edhi Home in Karachi. Despite repeated attempts by people, Indian authorities took no notice of her, let alone help her return home. Now, after Bajrangi Bhaijaan, Foreign Minister Sushma Swaraj asked her ambassador in Islamabad to visit Geeta and help bring her back. Is there another part of the world where popular art has more real consequences?! Judging from the popular reception of the film in both India and Pakistan (it has broken all box-collection records in both countries), Bajrangi Bhaijaan has achieved at a stroke what a thousand State-level dialogues and a hundred erudite tomes on war and peace in the Sub-Continent could not: It has cleared the room for a new, intelligent imagination of love, faith and faithful coexistence in this turbulent part of the earth. The beauty of Kashmir and Thar are invoked to metaphorize what is at stake in the cowardly shenanigans of leaders, armed forces, warlords and terrorists, or for that matter, in the shouting matches of warmongers on television or the laboured analyses of many intellectuals. While we certainly need good, incisive and accurate analysis, what we need even more is the public imagination to build happy, creative, peaceful narratives of faithful coexistence in the face of machine-guns, armoured vehicles, electric fences, high-security prisons, irresponsible governments and media, intelligence agencies, armed forces and terrorists virtually hell-bent on pre-empting and sabotaging any such collective initiative. 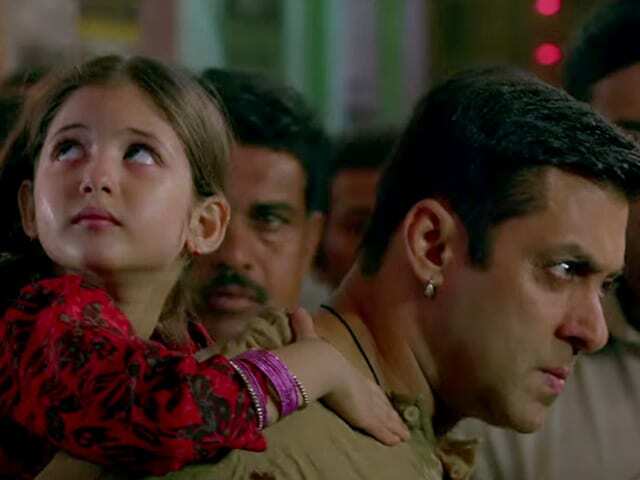 In this enterprise Bajrangi Bhaijaan succeeds beautifully at a popular level. The entertainment from one end of the film to the other is non-stop! Perhaps Salman’s existential predicament - born to a gifted Muslim Bollywood writer (no less than the co-scriptwriter of the game-setting Sholay) and a Marathi mother, making him the very embodiment of an Indian in so many ways! - helped him conceive the idea of a funny film on such a serious theme. Now Salman has set a higher bar for himself than he, perhaps, ever has. He has a lot to live up to now! Hum ko nahi maloom Salman ki tum doshi ho athva nahi. Ki ghalati tumhaari thhi ya phir kisi aur ki, ki tumne hiran ki hatya ki athva nahi. Insaan hoon, vakeel ya antar-yaami nahi. Nyaya aur kaanoon ki cheezein main nahi samajhta. Lekin itna jaanta hoon ki Khuda ya toh nyaya-poorna ho sakta hai ya phir karunawaan. Uska dono hona asambhav hai. Aur nyaya aur karuna ke beech agar hum se kisi ne bola choon-ne ko, toh is mein koi shaq nahi ki mera rujhaan kis taraf hoga. Sau khoon maaf karne ke liye toh gantantra ke buzdil leaderaan ya phir sadiyon mein ek baar aane waale Gautam Buddha ya Mahatma Gandhi ki zaroorat padti hai. Anguli-maal sabse sahan nahi ho paata. Lekin ek-do khoon maaf karne laayak toh hum mein se bahut saare hain. Un mein se bahut se log sarkaarein chalaana jaante hain, sarkaaron ka samarthan aur unki sahaayta toh karte hi hain. Aur aaj-kal toh ek mahaan desh-vyaapi-vyaapam chhida hua hai. Toh phir hum tumhaare gunaahon (ya tathaakathit gunaahon) ko kis nazar se dekhein? Agar tum qabool kar lo apni ghalati, to phir tumhe kyon na maafi mile? Hum sab ko ek swar mein aawaaz deni hai: Jai Bajrang Bali ki!Dharti maata ki Jai!